We have previously discussed how the environmental values often lose out to business or economic arguments because the environment remains something of an abstraction. When President Donald Trump heralds lower gas prices, that is a concrete value. However, when many of us call for cleaner air, it is treated as a good but not an immediate benefit. There is yet another study (in addition to our earlier discussed studies here and here and here) that show the real costs of air pollution. An article published in the European Heart Journal estimates that nearly 800,000 people die prematurely each year in Europe due to pollution and that every life is cut short by about two years. If that cheaper gas is put against a death or a two-year reduction in life expectancy, the political calculus may change. The study found much higher rates in Germany as opposed England. Germany showed 154 early deaths per 100,000 while England showed 98. The rate is likely much higher in the third world and countries like China and India with massive pollution problems. Various studies are finding the prior estimates were far too low. For example, research published in September found that 8.8 million people die prematurely around the world. Anybody think to question the alleged “statistics” that substantiate this statement? If not, why not? Dollars to donuts the study results cannot be reproduced. Do they still burn their trash in incinerators? The air in Los Angeles used to be unbearable when everyone had an incinerator. If that cheaper gas is put against a death or a two-year reduction in life expectancy, the political calculus may change. The 800,000 excess European deaths are not solely the result of particulate emissions from the burning of fossil fuels (ie gas). One of the sources of particulates listed in the report – biomass combustion – is classified as a renewable energy source even though it emits higher levels of pollutants when combusted than fossil fuels. It may be true that 800,000 European excess deaths are attributed to fine particulates some emitted during the burning of fossil fuels but how many life spans have been increased due to the use of fossil fuels? What about increased standards of living? The use of fossil fuels to power humanities dreams (eg refrigeration, transportation, communication, sciences, farming, etc) has lead an exponential increases in total human population, human life span and standards of living. Unfortunately there will always be excess human deaths attributable to particulate pollution but without fossil fuels humanity would still be living in the Dark Ages. Every human would struggle each and every day to eek out a meager subsistence while seeking to avoid the twin scourges of famine and pestilence. Of all the columns Professor Turley has posted, this one, more than any, has revealed the essential stupidity of Trump supporters. Here the Professor reminds us that polluted air is harmful to the general population. 50 years ago this finding would ‘not’ have been politically sensitive or offensive to Republicans. 50 years ago, leaded gasoline gave American cities a hazy smog on summer days. People could see with their own eyes the extent of air pollution. In these past 20 years, however, right-wing media has conditioned conservatives to think only liberals care about the environment. Which means clean air is a ‘gay issue’! That’s how dumb it gets!! ‘Liberals are flaky and, or, gay’, so any any issue that concerns them is discredited as less than masculine. American right-wing media has clearly dumbed-down conservatives. And the presidency of Donald Trump is dumbing-down his supporters to new lows every week. That’s because Trump himself has been dumbed-down by right wing media. So we’ve arrived at a point where establishment Republicans like Professor Turley are considered ‘wobbly’ for noting air pollution studies. Because Trumpers know their president doesn’t care about the environment. Trump’s new budget, in fact, calls for sharp cuts in EPA funding. And yet life expectancy is greater than 50 years ago. What’s your point? So Jim does that mean we needn’t concern ourselves with environmental matters? Like we’ve arrived at a point where air quality is inconsequential? Like Professor Turley is a sap for even raising the issue? The Clean Air Act was a good law that helped cut soot and other noxious emissions. Soot emission were super harmful and a terrible externality forced on local people by industry. Soot which is carbon particulate is different than carbon dioxide. CO2 is actually needed by plants to breath and is odorless. It is a natural part of the atmosphere. It too can become a problem, for sure, but it is not on the same level as plain old soot. Apples to organges. It seems to me that estimates like this distract from the much larger, ” big picture” problem tackled in the linked article. Dumb smokers got no reason. Domb smokers got no reason! Dump smokers got no reason to Live! They got little bitty eyes, and little bitty feet..
Little bitty voices going peep peep peep! Don’t want no dumb smokers. Don’t want no dumb smokers round here. How many of those dead people smoked tobacco? What evidence supports your assertion that “environmental values” often lose to business and economic arguments? 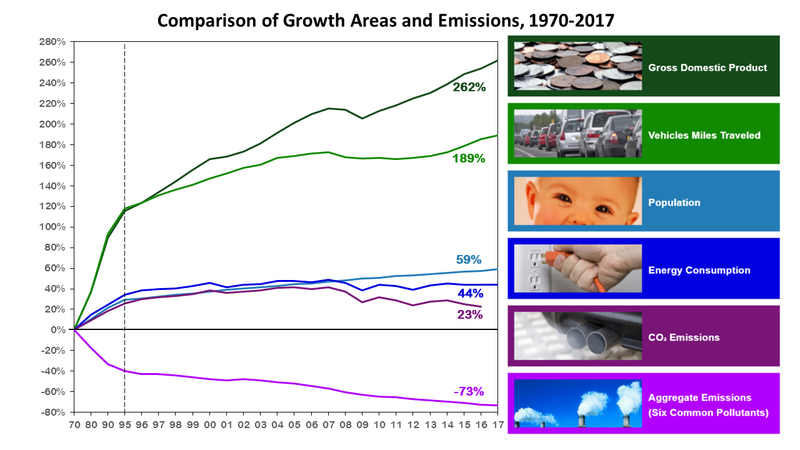 According to the EPA, emissions of six common pollutants have declined 73% since 1970. During that time, annualized real GDP has increased by 262%. That seems like a win/win. In other words, business allocated the resources necessary to provide the goods and services we want/need to improve our life while at the same time we are breathing the cleanest air we’ve ever breathed in our life. We also increased our population by about 120 million people since 1970 and we drive around 3 trillion vehicle miles per year compared to around 1 trillion vehicle miles in 1970. Higher GDP; increased population; and increased vehicular travel theoretically ought to create greater air pollution. Instead, pollutant emissions declined 73%. I don’t see how you interpret that as “environmental values” losing. We have previously discussed how the environmental values often lose out to business or economic arguments because the environment remains something of an abstraction. Only cranks adhere to ‘environmental values’. Ordinary people understand that pleasant surroundings are an amenity and the production of amenities is subject to consideration of scarcity and cost, like the production of anything else. The sticky point is that market transactions are insufficient in the endeavour to strike optimal balanaces when you have externalities and common property resources, so you need to apply public policy tools to induce welfare improvements. I suppose to doctrinaire environmentalists a relatively quick death by starvation is preferable to a protracted death by air pollution. Forgive me for understanding the world is full of trade-offs and that totally favorable outcomes reside in the next world not the present one. I don’t buy the study for reasons articulated by Thomas Johnson (infra) along with the maddening rise of advocacy science rooted in “we-know-betterism.” Scientists used to be our trusted advisers and not our pestering nannies. That old saw, “believe half of what you read and none of what you hear” needs to be reworked to equalize the options. Funny how there is no mention on how much technology and cheap energy has added to life expectancy. If the true goal is increasing life, then you would think we would be advocating way less regulation to unleash large numbers of “two guys in a garage” type experimenting in all fields. Yes this leads to several failures but it also spawns way more innovations than an over regulated population. I just briefly skimmed parts of the report from the European Heart Journal….it would take hours to really “look up under the hood” of the report’s details. One comment that stood out was the estimate of 8-9 million annual deaths due to “adverse environmental conditions”. The report seems to focus soley on pollution in developed countries as the “adverse environmental conditions”. If there’s a study that draws conclusions about the adverse environmental factors in third-world countries, it’d be interesting to see the “additional death estimates” caused by polluted water supplies, unsanitary living conditions, etc. I remember a discussion in college in the 1970s when a classmate, decrying the presence of chemicals like chorine in cities’ water supplies, seemed to prefer more “organic hazards” like E Coli, etc., to the possible long-term dangers of exposure to chemicals like chlorine that “might” be suspected of slightly elevating cancer risks with a lifetime of exposure. I suppose if that particular risk is suspected, an effective way of reducing elevated long term cancer risks is to kill people off much sooner with the immediate (and “organic” ) health hazards; that’s what made me wonder if there are similar studies including all “adverse environmental” factors in third world countries. Heard 3/20 Bayers new Roundup is twice as strong as Monsanto’s crap. Only in American, Hitler’s Chemical Weapon plants continue. I have always wondered about the methodology of these kinds of claims. I want to see empirical data that unequivocally shows a carbon or any other atom or molecule was the singular cause of death. I’ll never see it because it doesn’t exist, rather these studies are mere speculation and estimations wrapped in emotional pontifications. Any individual, if they cared, could wear filtering apparatuses. Homes and buildings could, if individuals wanted, have air filtration. Keep in mind the key phrase in the study’s title: “novel hazard ratio functions.” The study’s content explicitly says “estimations.” Well, “bs” is also an estimation. How about a little concrete? Arnie Gunderson was studying the fallout from Fukushima. His team was trying to collect car air filters & such items from here & I think around the world. Notice not a word in the news about it now 8-9 years later. And don’t look at all the sea life dying in the Pacific……. I’m interested in Turley’s article here, but I was thinking of some fun 1st. Shows that priorities are often out of step with needs. I seen in the news feeds today another person won their case in front of a jury that Monsanto’s Roundup caused their cancer. With Spring here every fool will be our spraying Roundup North/South/East/West in the US to get rid of a few weeds. The Ironic thing is that even the Cancer Treatment Center’s ground keepers will also be spraying it & the people, like everyone, they’ll whine, why did my family member, friend or myself get cancer, we don’t smoke after all. LOL, Sarc. Not to keep going, just look at the messes Nuke Energy is making. 1st the Mine sites, places like the Hanford (sic) site in Washington, the toxic sites on the East Coast & elsewhere, Chernobyl & the notorious Fukushima (sic) the Radiation Cancer Gifts that keep on giving. I still wonder what on earth Bayer was thinking when they paid good money to subject themselves to all that legal exposure. I guess when a company made itself famous for creating blood thinning aspirin, they are accustomed to hemorrhaging. Fantastic, Darren! May I use this please? Nuclear is the cleanest safest power gen we have. That’s the myth they sold some people. It’s not cheap energy, nor is clean energy & it’s the most inefficient, in it’s current form. That’s the way it is when one considers the whole process from the ground the uranium is mined from to the almost never ending cost of storing the waste, plus the radiation pollution problems. There are those that think maybe Thorium-based nuclear power can over come those problems with the current nuke power planets. I’d be interested in that sale’s pitch. I disagree. Nuclear has never been done correctly here due to our own red tape. What radiation pollution problem? As for Thorium I agree. Sodium reactors are the better solution but unfortunately the DOD got involved with the decision and light water reactors won. The average construction duration of the early nuclear power reactors built globally (i.e., all countries) was: 3.5 years for the first three, 4.0 years for the first ten, 4.4 years for the first twenty, 5 years for the first thirty, and 5.4 years for the first eighty . The first completed US power reactor was constructed and sending power to the grid in 1.8 years [29,35]. That was 60 years ago. It’s useful to compare how construction duration decreased in other large, complex systems as more were built. Fifty Casablanca Class aircraft carriers were built and commissioned for the US Navy between November 1942 and July 1944. The duration was reduced from a maximum of 277 days to 101 days . This represents a learning rate for build duration of 22% for all fifty, and 34% for the last thirty-eight. That first US power reactor was 5 MW, totally free enterprise, no government money involved and was built from scratch to supplying power to the grid in just 22 months http://www.asme.org/getmedia/3663519d-0882-4b7e-ab6c-f036b080cfdd/128-vallecitos-boiling-water-reactor-1957.aspx . Keep it in mind it’s just a rumour that Tesla’s latest self driving car, the Tesla Exploder, went out of control again, ran into a Tank Farm & bust into flames. I think it was CNN that also had an unconfirmed factual story. CNN now has 3 unidentified sources ready to swear to Mueller’s Grand Jury that Donald J Trump was driving the said Tesla with the help of Putin in control of the joy stick connected to the car. What a way to conflate things Turley. A) Gasoline isn’t the culrpit. B) The so-called study’s methodolgy wasn’t discussed at all in your article. C) We were not provided a breakout between the former Iron Curtain and western Europe. D) Weren’t the Kyoto Accords supposed to remedy all this. E) What other factors could cause more Germans to die earlier than the English? Diet. Lifestyle. Prodigious amounts of beer consumed regularly? I expect more out of you Turley. Instead, I get hysteria like this. Debating whether or not to unsubscribe from your screeds. The article provided a link which provided much more in methodology (including maps and graphs) that I suspect you’re willing to digest. The only information I was wanting for was the deaths and shortening of life-spans in America, which you would likely ignore as well. I get those who would be impacted financially by the change required to clean up our climate. I think they’re selfish and short-sighted but I understand. What I don’t get is the people whose only link is ideology, who have been convinced it’s in their best interest to eliminate regulation and refuse to address climate change and pollution, when their only benefit is a shortened life? Unregulated technology and cheap energy has done more for our lifespan than take it away. Unregulated begs the question, “How many people are we willing to let die?” More accurately, “How many people are those in power to let die in order to maximizre their profits.” Those making those decisions, generally aren’t the ones at risk. Or to put it another way, how many are we willing to let die by artificially raising the costs of energy or stifling creativity with red tape? How do you present information that is conclusive in this particular case? You can only show correlation. I would argue diet and lifestyle are a much larger and clearer threat to public health and create more of an impact on mortality. But then again, those risk factors are under one’s direct control; they serve of no use to the one’s whose goal is to obtain more repressive political power. Obviously, they are not burning that clean clean coal.